The 90-year-old ice-skating destination at Half Dome Village is now open. It's one of the most scenic places to spin in the Golden State. And it opened for the season, just after Thanksgiving 2018, hurrah. DONNING BLADES... in a beautiful area? That depends upon the eye of the beholder, and blade-wearer, of course, but the truth is this: Many ice rinks, including those seasonal rinks that pop up in late fall, enjoy spectacular settings. There might be skyscrapers in the background, or a load of Christmas decorations, but whatever is nearby, skaters can count on enjoying a plethora of pretty things to see, as they spin around and around and around the rink. But one California rink rules them all, in terms of an incredible setting, and to argue the opposite is an errand best left unrun. 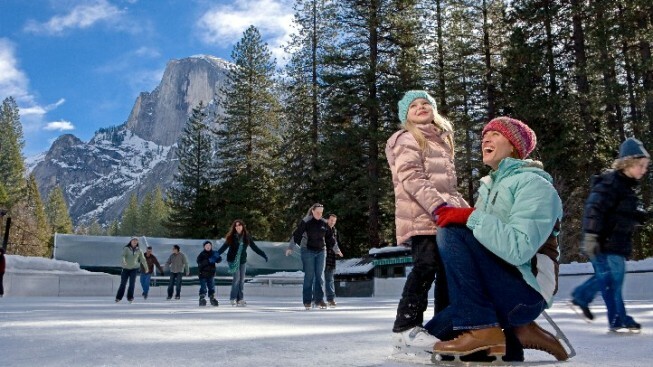 It's the rink at Half Dome Village, in Yosemite Valley, and while other rink builders may add cool things to see outside of their nifty icy ovals, this rink's vistas include the granite-towering wonders of the national park. Trees, too, add to the terrific experience, and the fact that, yes, you're in the Big Y, far from home, and savoring nature. AND THE RINK IS NOW OPEN, thanks to some chilly weather that swept into the Sierra over Thanksgiving Weekend. Chilly days will continue to sweep in, in fact, as December begins, meaning your whole "bundle-up, skate-hard" plan can come to fruition, if you've got a Yosemite vacation in the works. Price to skate? If you're an adult or senior, it's a quarter shy of ten bucks, so, yes, $9.75, while kids can skate for $9.25. Renting skates? That's $3.25. Warming up? There's a fire pit for that. Feeling the marvels of the location? There are views of Half Dome for that. Skate by the famous ice rink's site now to find out how you can spin around one of the most sublime ice-topped surfaces in this state, or any other, now.